Merry Christmas everyone ! May the festive season bring us positivity and new beginnings! May Santa fill your stockings with hope and your hearts with love! let's celebrate boundless love, compassion and faith! Merry Christmas to all! Preheat oven to gas mark 4-5. Take a cupcake tray and butter lightly. Take 4 sheets of pastry and place on top of each other, lightly butter them between each layer. Cut the pastry into 15 equal squares. Each square is now 4 layers thick. Use these squares to line the tin to make 12 pastry cases.Place small amount of mincemeat in each pastry case and bake them for 7-8 minutes or till light golden brown. Cool them on a baking tray and dust with icing sugar. Enjoy with cream or custard. Very innovative way to make mince pies looks great. Xmas wishes Jag, those fillo pastry mince pies looks super cute and inviting. first time in your space n wow...the pies look so good...delicious...nice clicks dear ! 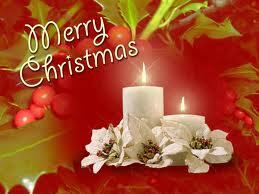 I'm your new follower now...do visit my space in your free time.. wishing u n ur family a Merry Christmas ! Merry Christmas Jagruti. Mince pies look so cute.